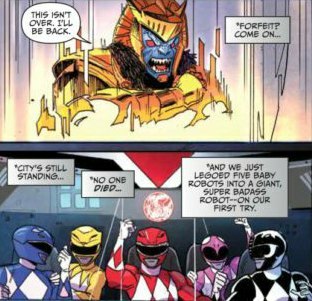 A Go Go Power Rangers #2 Review – Jason and Trini?!? Monsters and morphers notwithstanding, thus far the teenagers in Go Go Power Rangers have been written fairly realistic. So it stands to reason that five hormonal high schoolers suddenly placed in a such a high pressure situation would feel…closer. While there was never a romantic link between any of our original five Rangers on the TV show, this series was bound to give us a crush, an unrequited love storyline, a fling, or something along those lines. Trini and Billy would have been my first guess, as they’re kindred spirits. Jason and Kimberly would be a little obvious, but not impossible. You’ve also got Trini and Zack, who were together in the Pink miniseries BOOM! put out last year. But Jason and Trini? They might have been my last guess. 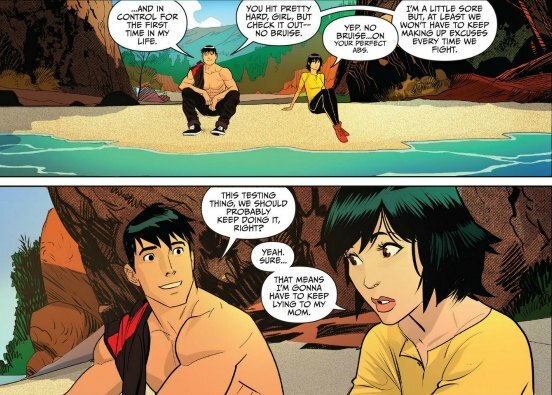 Actually, in this case it’s Trini crushing on Jason. I won’t say I don’t get it. Even with his cutesy millennial haircut, the Red Ranger is still a stud. Go Go Power Rangers #2 shows us the conclusion of the Rangers’ assault on Rita Repulsa’s palace, and clues us in on the long-term ramifications the fight has for them. We also get into some of the more personal ramifications that “Arrival Day” (i.e. the day Rita’s forces first attacked) has had on them. This includes Kimberly’s strained relationship with her boyfriend Matt. Trini never had much in the way of romance on the show. Early in the second season, they created a character for her to fawn over. But that never went anywhere. Tommy and Kimberly filled most of the show’s romance quotient. So to see Trini trying to be romantic with anyone, let alone Jason, takes some getting used to. But thus far, it works. Jason is apparently oblivious at the moment. Considering Trini has been written very shy and soft-spoken, I’m curious if Ryan Parrott is going to make her someone attempting to come out of her shell and be noticed. 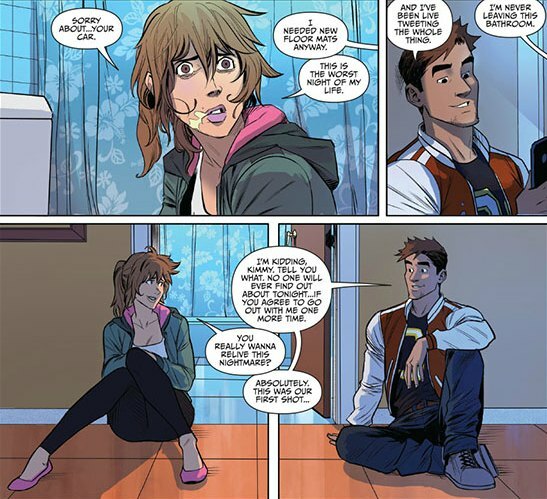 The issue highlights the fact that, after the fight at the palace, Rita has learned the Rangers’ first names. The Red Ranger is Jason, the Pink Ranger is Kimberly, etc. Zordon promises to do what he can to protect them. But what confuses me is, how does Rita knowing their names put them in any more danger than they were already in? I’d be more concerned that she saw their faces when they fought the putties on Arrival Day (cool name, by the way). On the show, she was always able to ambush the teens with putties, monsters, and what not. So she can clearly find them in Angel Grove. (Apparently that’s exactly what we’re going to see in issues to come.) How goes knowing their names make it worse? It’s not great, mind you. But it’s hardly the worst case scenario. Considering the palace fight, this fear about Rita knowing their names and attacking them as civilians, and a few lines about the teens wanting to let their families in on their secret, Parrott seems to be going out of his way to explore new territory, and address certain things the show never did. Even more than Kyle Higgins has done in MMPR, he’s having fun bucking the show’s original structure. Dan Mora’s pencils have been, by and large, excellent. I’ve praised his renderings of Goldar in the past, but I really noticed his work on Rita here. That giant headdress and Madonna-style pointed bra don’t exactly give her the most foreboding look. But despite his fairly animated style, Mora shows restraint when drawing Rita’s face. Particularly toward the middle of the issue. This makes her seem more cold and calculated, as opposed to angry and loud. Near the end, Mora draws her entering Finster’s lab clouded in shadow, so we merely see a silhouette. To say that costume casts a distinct shadow is an understatement. Then in the very next panel, the silhouette gives us a sinister grin. Throw in the use of additional black space to highlight the gears and gadgets in Finster’s lab, and it becomes the issue’s best page. The tone of Go Go Power Rangers compared to the MMPR book is becoming more apparent as we dive further into the lives of our heroes. There’s potential for some really, really good stuff here. Power Rangers fans should be very excited. I certainly am. This entry was posted in Comic Books/Graphic Novels and tagged Billy Cranston, Black Ranger, Blue Ranger, BOOM! Studios, comic book reviews, comic books, Dan Mora, Go Go Power Rangers, Go Go Power Rangers #1 (2017), Go Go Power Rangers #2 (2017), Go Go Power Rangers (BOOM! Studios), graphic novels, Jason Lee Scott, Kimberly Hart, Mighty Morphin Power Rangers, Pink Ranger, Power Rangers, Power Rangers comics, Red Ranger, Rita Repulsa, Rob Siebert, Ryan Parrott, single issue reviews, Trini Kwan, Yellow Ranger, Zack Taylor on 09/04/2017 by primaryignition. There’s a reason it’s taken 20 years for us to get quality Power Rangers comic books. So many of today’s creators grew up with the show and have a special fondness for it. As such, this campy TV show that so many have dismissed as mindless fluff is now being shown an unprecedented amount of love and respect. You can see it in both the broad strokes and the smaller details. Case in point, the first few pages of Go Go Power Rangers #1 takes us back to the events of the show’s premiere episode, “Day of the Dumpster.” The climactic point in the episode sees the Megazord take on Rita Repulsa’s henchman Goldar for the first time. In the end, Goldar retreats. He insists, “This isn’t over! I’ll be back!” With that, he throws his forearm horizontally across his chest and vanishes. There’s a panel on one of those early pages that depicts that same line and pose (shown below). As a lifelong PR fan, little things like that make me so happy. It shows me our creative team is as passionate about this as I am. You don’t always get that with a licensed book like this. But when you do, it can be a beautiful thing. 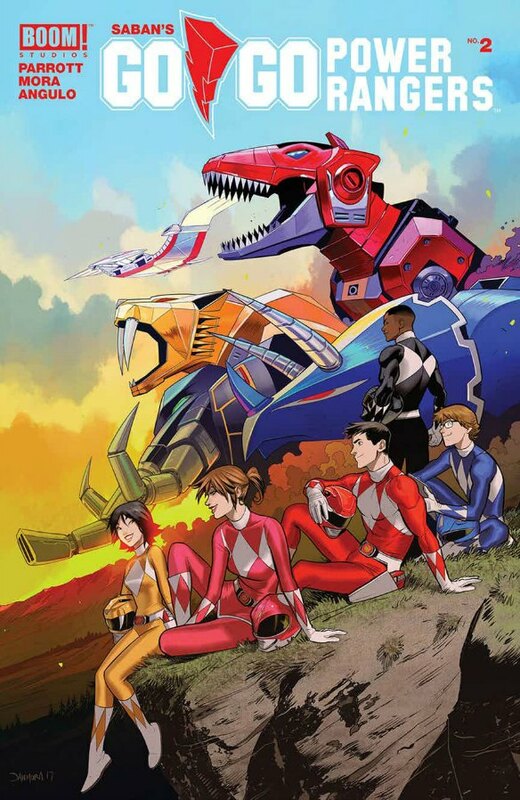 Spinning out of the success of BOOM’s Mighty Morphin Power Rangers title, Go Go Power Rangers kicks off at the tail end of “Day of the Dumpster.” Our five young heroes are adjusting to their new lives as superheroes. But before the battle lines are completely drawn in this ongoing battle with Rita, the Rangers take the fight straight to her doorstep. To save the astronauts that accidentally freed the evil empress, our heroes storm her moon palace head on. They wanted a fight. Now they’ve got one. Go Go Power Rangers is apparently aiming to be more character-focused than its sister series, with a stronger balance between teenage drama and superheroics. This issue has an extremely positive indicator in that respect. Unlike virtually every other PR story from BOOM!, Go Go Power Rangers gets Zack right. We also get an early morning scene with Jason training before school. It’s designed to give us a little bit of Jason’s background, and that’s all well and good. But I just like seeing him be so tireless and hardworking. It’s similar to what Kyle Higgins and Rod Reis were so successful with on their portion of MMPR Annual 2016. This issue introduces us to a character named Matt Cook (shown below). He’s in the circle of friends with Jason and the others. But he obviously has no idea they’re superheroes. Matt also happens to be Kimberly’s boyfriend. By all indications he’s a good egg like the others. I almost feel sorry for him. He’s clearly about to be boxed out of the group. Sorry, dude. We can’t all be Tommy Oliver. As a kid, I always wondered why the Rangers never took the Wizard of Oz approach and attacked Rita at her palace. It looks like this opening story is going to show us why. Mind you, it’s not simply an ambush. They’re trying to rescue the two astronauts we saw in “Day of the Dumpster.” In over two decades, it never occurred to me that those two could have been captured. It seems really obvious in retrospect. When the team teleports directly in front of the palace, they’re met by an army (literally an army) of Putties. And of course, they later have Rita and Goldar to contend with. Dan Mora, along with colorist Raul Angulo, show us both the interior and exterior of the palace from a bunch of different angles. This includes the gloriously ludicrous neon “Bandora Palace” sign. 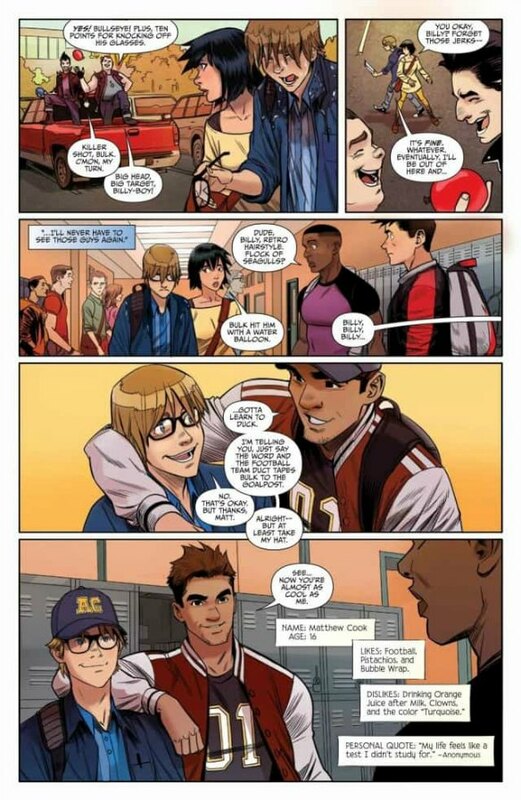 I was very impressed with what Dan Mora showed us in MMPR Annual 2017, and I’m still impressed now. 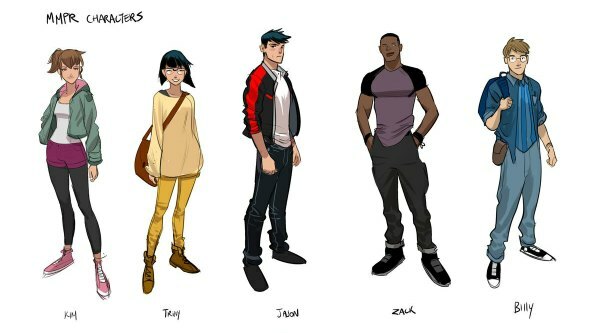 Mora’s teens are much more expressive and animated than we’re used to seeing in MMPR. But his action sequences also deliver that same epic, awe-inspiring feel we’re used to getting. He’s very balanced in that respect. And of course, he still draws an awesome Goldar. Also, his rendering of the Megazord is one of the best I’ve ever seen. The only updated look I take a bit of exception to is Jason’s. Something about the longer hair and the jacket rub me the wrong way. I’m not in love with Trini’s new hairstyle either, but it’s somehow less grating. Also, I just noticed Trini’s wearing glasses in the image below. That’s different. 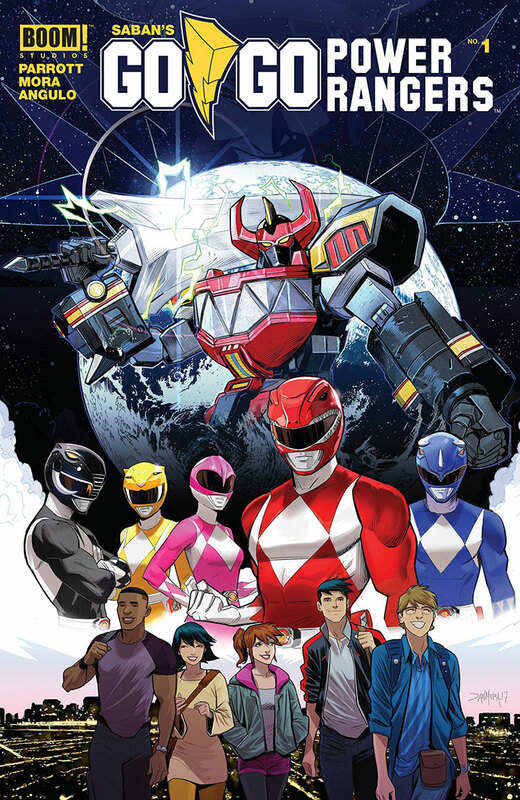 Nitpicking aside, I enjoyed Go Go Power Rangers #1 as much as I’ve enjoyed any issue of BOOM! Studios’ MMPR series. Maybe even a little more. I admit, as a reviewer I’m likely biased when it comes to these books. As a fan, I’m so proud of everybody at BOOM! for what they’ve given us. Proud and grateful. This entry was posted in Comic Books/Graphic Novels and tagged Billy Cranston, Black Ranger, Blue Ranger, BOOM! Studios, Dan Mora, Day of the Dumpster, Go Go Power Rangers, Go Go Power Rangers #1 (2017), Go Go Power Rangers (BOOM! Studios), Goldar, Hendry Prasetya, Jason Lee Scott, Kimberly Hart, Megazord, Mighty Morphin Power Rangers, Pink Ranger, Power Ranger costumes, Power Rangers, Power Rangers comics, Power Rangers costumes, Red Ranger, Rita Repulsa, Rob Siebert, Ryan Parrott, Trini Kwan, Yellow Ranger, Zack Taylor on 07/28/2017 by primaryignition.